From sit-down restaurants to soda fountains, Bozeman has been home to a great variety of tasty hangouts over the past one hundred years. Nothing compares to greasy, finger-licking comfort food, sweet treats, and servers who know your name and your “usual.” While it is impossible to mention every beloved diner, here are a few of Bozeman’s popular downtown establishments from the previous century. 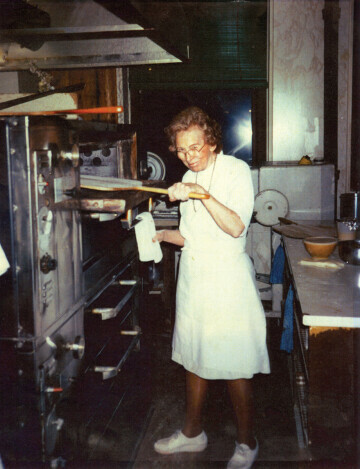 In 1960 Audrey Anderson moved to Bozeman and purchased the only locally owned pizza place. Over the next thirty years, Audrey’s Pizza Oven employed scores of young people and provided a venue for hundreds of first dates. Audrey, Bozeman’s favorite red-headed restaurant owner, grew up in an orphanage in Twin Bridges, Montana. She worked as a telephone operator before marrying her first husband, who died after an accident on their honeymoon. Audrey’s tough love management style made her a substitute parent for many kids. Loyalty to Audrey pried sleepy employees from their beds on freezing winter nights when customers needed a pizza delivered. She still tossed pizza dough in the air at age 88, but Audrey’s Pizza Oven finally closed in 1990. In 2010, however, the restaurant reopened, reviving Audrey’s original recipes and putting her pizza boards to use once again. 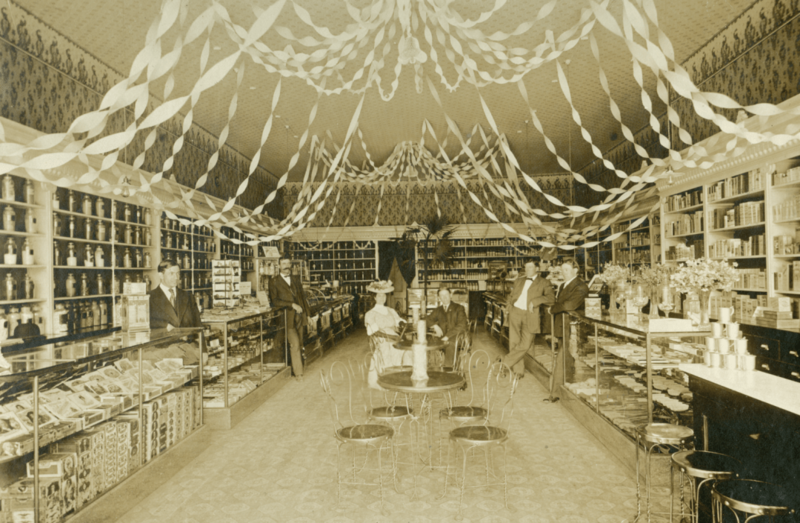 F. W. Woolworth & Company was a “five-and-dime” store chain that originated in New York in the late 1870s. 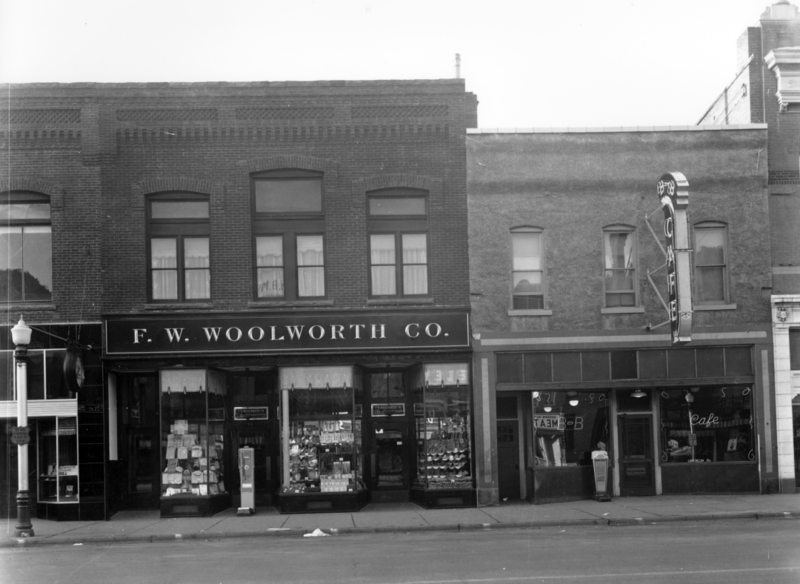 The Bozeman Woolworth’s, at 26 East Main, was a variety store with a popular lunch counter that served sandwiches and hamburgers to downtown employees and folks running errands nearby. The counter also had a daily lunch special and a full soda fountain, which attracted a loyal regular crowd. A Woolworth’s employee that worked the lunch counter as a teenager in the early 1970s remembers one repeat customer in particular. Audrey Anderson from Audrey’s Pizza Oven frequently took her noon-time break at Woolworth’s, where she always ordered a fish patty with a side of cottage cheese. Audrey’s lunch orders were typically very predictable, but occasionally she broke from tradition and ordered another item on the menu. Woolworth’s was also famous for their amazing peanut butter pie, so every now and then Audrey would splurge and indulge in a slice of the decadent dessert. Another well-patronized diner, the Snappy Service Café, was located on the southeast corner of Main Street and Bozeman Avenue (a spot currently occupied by the First Security Bank building). In the 1950 Bozeman Polk City Directory, the Snappy Service advertised lunch fare and more: “Steaks and Chops, Sandwiches, Soft Drinks, Candy, Cigarettes, Etc.” This little building had a large sign out front that advertised hamburgers, and, as its name implies, prided itself on providing speedy meals. Starving college students fell in love with Manny Voulkos, owner of the Burger Inn diner. Inability to pay for one’s meal was never an issue with Manny, who allowed diners to work off their tab, if need be. “Manny’s,” as the Burger Inn was affectionately called, boasted greasy comfort food, an active juke box, and inexpensive prices. In a 1995 article in the Bozeman Daily Chronicle titled “Memories of Manny: Big-hearted Diner Owner Dies at 70,” community members reflected on their experiences with Manny and his restaurant. According to one interviewee “‘He wasn’t known for his culinary skills or special dishes,’ and ‘he may have actually invented cholesterol.’” “Voulkos ‘had a philosophy that if you smiled first thing in the morning you got over it for the rest of the day.’” Open late and ever popular with Bozeman’s college crowd, Manny’s was located at the corner of 7th and Main and closed in 1981. 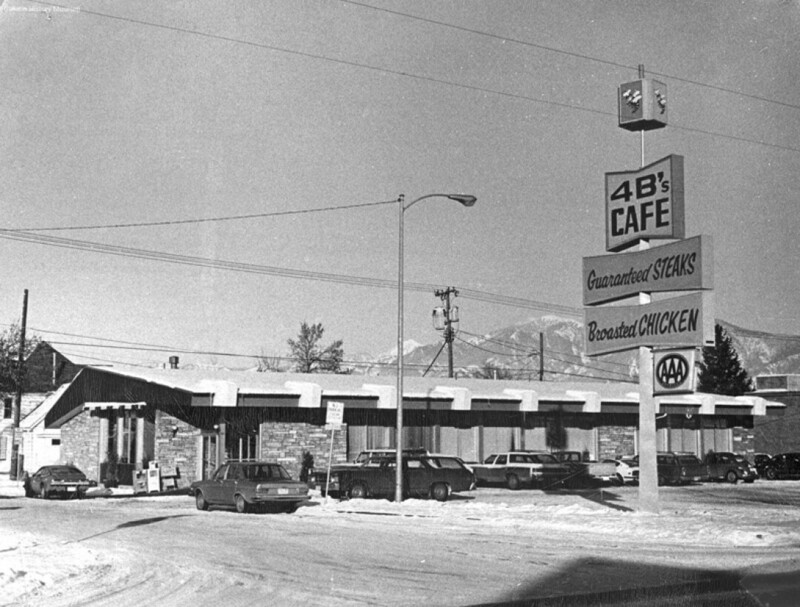 Bozeman’s 4B’s restaurant opened in 1965, at the corner of 5th and Main. A Montana-born establishment, 4B’s family restaurants began in Missoula in the late 1940s. The Hainline family—Bill, Barbara (Buddy), Bill Jr. and Barbara (hence the name)—opened the first restaurant in Missoula, where they followed a business plan based on quality food, a clean restaurant, and friendly hospitality. Bozeman’s 4B’s was well-known for being open 24 hours a day, which made it a popular night-time stop for folks downtown. 4B’s famous tomato soup was a great hit with diners, but the Bozeman restaurant closed its doors in 2003 after nearly forty years on Main Street. 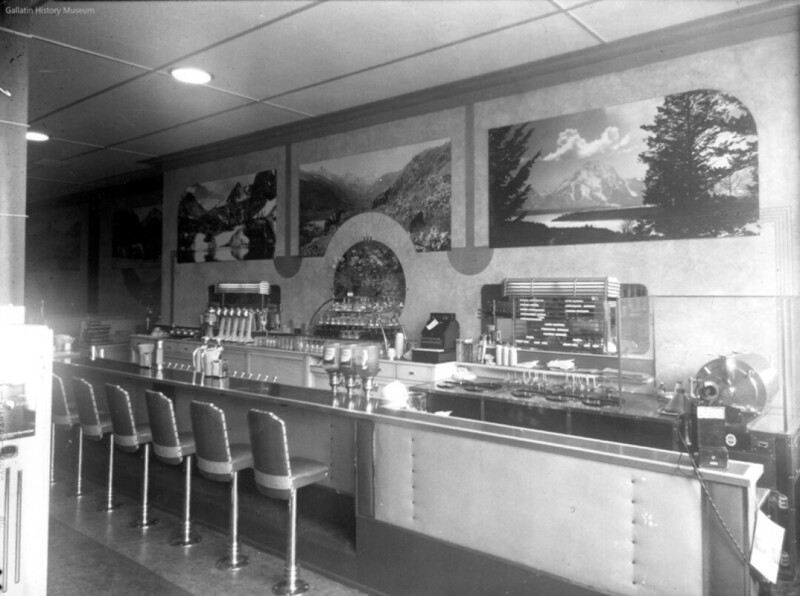 Soda fountains were certainly among the most popular hangout destinations for generations of Bozeman youth. Besides providing quick meals and tasty treats at reasonable prices, these popular establishments were conveniently situated in the heart of downtown, easily accessible by foot from schools, theaters, and residential neighborhoods. Many soda fountains and lunch counters were traditionally combined with a drug store or pharmacy, which provided a convenient source for some popular soda fountain drink ingredients. One early fountain drink, the phosphate soda, combined fruit flavorings and soda water with a touch of phosphoric acid. This created a sweet and tangy treat similar to today’s soft drinks. One of the community’s longest-lasting soda fountains, The Bungalow, closed its doors in 1994, but still lives on in the fond memories of many locals. The wildly popular soda fountain and lunch counter opened in 1910 as a confectionery and ice cream parlor. It didn’t become a drug store until the early 1950s, but throughout its eighty-year history, the lunch counter was known for its small-town atmosphere and comfort food. Patrons enjoyed everything from burgers and sandwiches to sundaes, phosphates, and malts. Centrally located at 14 West Main Street, The Bungalow was the perfect post-movie destination spot for folks exiting the Ellen and Rialto theaters. Because of its proximity to the old Gallatin County High School (3rd and Main), the Bungalow was also a popular after-school gathering place for a date with friends. In later years, children slurped milkshakes from their favorite perches atop beloved pink-and-white spinning barstools, and lunch patrons grabbed a quick bite while they chatted with the servers behind the counter. The Bungalow Drug always felt like home. and friendly, they were more than mere restaurants—they were the places where so many memories were made. Now, time for some peanut butter pie!